Why Choose Utah for Online Higher Education? Utah ranks among the most educated states in the country and possesses a highly qualified workforce because of this achievement. The Georgetown Center on Education and the Workforce projects that by 2020, 64% of jobs in the state will require some form of postsecondary education. Utah’s colleges and universities boast some of the lowest tuition rates in the country, making higher education accessible to both in-state and out-of-state students. This page offers an overview of online education in Utah, a ranking of the top schools, and answers to common questions about affordability, credit transfer, and enrollment processes. Like most U.S. states, Utah has substantially expanded its online education offerings throughout the 21st century. The state now serves more than 100,000 learners at both the graduate and undergraduate level in over 30 online programs. The flexibility and convenience of online learning offers increased opportunities to a broad cross-section of demographic groups, including single parents, full-time workers, and workers employed in shrinking labor industries, such as manufacturing. Most online colleges in Utah offer inexpensive tuition rates, but students enrolled at public institutions can expect to pay far lower tuition if they hold Utah state residency. To receive resident status, a student must live in Utah for at least 12 continuous months, register to vote, obtain a Utah driver’s license, and be declared financially independent for tax purposes. Residents of some neighboring states may also receive in-state tuition through reciprocity agreements. The chart below indicates the difference between in-state and out-of-state tuition at two- and four-year schools. On average, Utah’s four-year schools boast far lower tuition rates than the national average, both for in-state and out-of-state students. Utah’s tuition at two-year public schools runs slightly higher than the national average. Online courses require fewer resources than on-campus courses, and online students typically pay a lower tuition rate than campus-based students. Below, you’ll find tuition estimates for online education at three popular institutions in Utah. While costs vary, these figures offer a general sense of tuition rates among different types of schools. Thousands of online learners nationwide enroll in Utah’s colleges and several states feature benefits for nonresident learners. For example, reciprocity agreements may offer greatly reduced tuition to residents of nearby states. Some schools may even offer in-state tuition rates to out-of-state students enrolled in online programs, though state restrictions often apply depending on the program. As a member of the Western Interstate Commission for Higher Education (WICHE), Utah offers significant education opportunities for residents in states like Alaska, Arizona, California, Colorado, Hawaii, Idaho, and Wyoming. WICHE’s Western Undergraduate Exchange (WUE) enables students to enroll in undergraduate programs in any member state at a reduced cost, paying 150% or less of the resident tuition rate. Eligible students enrolled in the WUE can attend nine member institutions in Utah, including the University of Utah, Utah State University, and Southern Utah University, saving an average of $9,000 on tuition annually. Given the various state regulations that govern requirements for academic programs, enrolling in an online program as an out-of-state student can prove daunting. The National Council for State Authorization Reciprocity Agreements (NC-SARA) works to expand access to online education, demystify interstate education regulations, reduce costs for online students, and enhance the quality of online learning programs. Utah’s NC-SARA member institutions offer approved online education programs to out-of-state residents; however, students should also check with specific schools about individual program regulations and requirements. Utah provides many affordable online schools, but finding the right institution to fit your needs can be a challenge. Many factors come into play when researching colleges, such as academics, accessibility, price, variety of programs, and reputation. 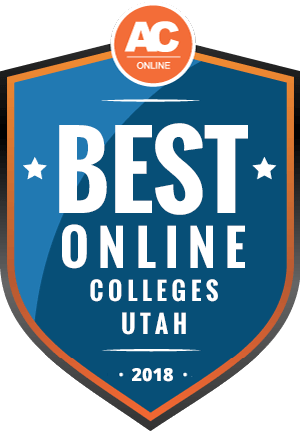 One school does not suit every student’s needs perfectly, but our ranking of the best online colleges in Utah delivers an overview of the state’s most respected institutions, focusing on schools that feature both affordability and academic quality. Online education offers convenience and flexibility, but it simultaneously presents a different set of uncertainties. Consult the FAQ below to find answers to some of the most common questions about online schools in Utah. Do online credits cost more or less in Utah? Utah provides some of the most affordable education in the country for in-state and out-of-state students. While the national average for public in-state tuition at four-year schools comes to $8,778, Utah’s tuition rate of $6,140 ranks among the lowest of all states, with only Nevada, Wyoming, and District of Columbia offering lower tuition. Utah’s private colleges also feature low tuition rates, charging an average of just $7,571 per year — a rate nearly four times lower than the national average and rivaled only by Idaho. The one area in which Utah does not offer low tuition is two-year schools, where its annual rate of $3,569 is slightly above the national average. In many instances, schools offer reduced rates for online students, so it never hurts to investigate tuition incentives for online degrees in Utah. Which Utah schools accept the most transfer credits? Students commonly transfer to online colleges in Utah, and many institutions, including the University of Utah and Utah State University, allow transfer credits. However, degree candidates must complete at least 30 credits at their transfer institution to graduate with a bachelor’s degree. When researching transfer policies, you should determine whether a school classifies transfer credits as equivalent or elective credits. Equivalent credits fulfill major requirements, and schools treat these credits the same as if they were earned on campus. However, differing credit equivalencies may result in some transfer credits counting only as elective credits, even if classified as major credits at another institution. Always check with a school’s admissions office to determine exact credit equivalencies. Community colleges in Utah typically maintain articulation agreements with many of the state’s four-year institutions, enabling students to complete their associate degree at a two-year institution before transferring over to a four-year school for their bachelor’s. Schools may also offer degree pathways that create a seamless transfer of credits between institutions, ensuring that students only complete courses that transfer over as equivalent credit. Will any online colleges in Utah accept a GED? Many online schools in Utah accept nontraditional students, and a successful score on the GED often serves as the only requirement for enrollment. For example, the University of Utah, one of the state’s most prestigious public institutions, requires a minimum composite GED score of 550, along with a minimum score of 500 on all subsections. Utah State University, another selective public college, requires a minimum composite GED score of 660. USU also offers open enrollment for many of its associate and professional certificate programs, enabling students to apply if they hold any passing score on the GED. Similarly, most of the state’s community colleges provide open enrollment and include pathways for students without a high school diploma. Even without a strong GED score, students can enroll at a Utah community college and earn lower division credits before transferring to a four-year college for their bachelor’s. Most schools, like Salt Lake Community College, offer introductory placement tests that determine course levels for new students. If you hold a GED, be sure to consult with a school’s admissions office to determine specific requirements before applying. How many academic terms per year do online colleges in Utah offer? Many of the top online universities in Utah offer flexibility in their enrollment, providing several start dates and rolling admission throughout the year. Both the University of Utah and Utah State University, for example, begin classes twice each semester, with start dates in August, October, January, February, May, and June. Fully online colleges, like Western Governors University, offer even greater flexibility in scheduling, with courses and degrees that begin the first day of each month. Additionally, community colleges in Utah provide flexible start dates for online students. Salt Lake Community College features classes of varying lengths, including 16 weeks, 12 weeks, and eight weeks. Like most online schools in Utah, SLCC delivers start dates throughout the year in the fall, spring, and summer semesters. Which online colleges will accept FAFSA in Utah? All of Utah’s accredited online colleges and universities accept the FAFSA. Schools require students to complete the form to gain eligibility for grants, scholarships, and other financial aid opportunities. Before researching financial aid opportunities, you should fill out the FAFSA to maximize your chances of receiving financial support. You can fill out the FAFSA starting October 1st each year. You should typically try to complete the form as early as possible, as this can increase your chances of receiving certain competitive forms of financial aid, such as work-study opportunities. If you qualify as low income, the FAFSA can unlock many aid opportunities that do not need to be repaid, such as Pell Grants. Even if you fall under a higher income bracket, the FAFSA provides valuable opportunities for financial support, and online students receive the same consideration as campus-based students. Are there any free online classes I can take from Utah colleges? The proliferation of online education offers opportunities not just for enrolled students, but for anyone interested in broadening their education. Utah colleges feature several online programs for non-enrolled students, building specialized or general knowledge in a self-directed distance format. Some schools, such as Salt Lake Community College, provide a variety of Open Education Resources, including fully online courses and supplementary materials, such as textbooks, available free of charge. These courses lack faculty supervision, meaning that students move through material at their own pace and receive no grades or feedback. Open Education offers many opportunities for enrichment to self-motivated students. Other schools, such as Utah State University and the University of Utah, deliver a variety of accredited online programs either for free or at a reduced cost. These continuing education programs focus on various academic and professional topics, covering areas like climate change, agriculture, art history, and information technology. USU, for example, features courses on practical subjects such as home buying and gardening at a cost of less than $100 per class. How can I find the online program options at Utah’s colleges? While Utah does not hold a dedicated online state university platform, most of its largest colleges, including Brigham Young University, the University of Utah, and Utah State University, maintain dedicated online education pages that provide access to a variety of resources for distance learners. Most pages feature listings for online degrees and courses, application information for prospective students, and general information about what to expect from online learning. Online students also receive a variety of support services, including tutoring, technical support, exam proctoring, and library resources. Additionally, many online schools in Utah offer admissions counseling services for prospective students to clarify applications, enrollment, and the general practices of online learning. When researching financial aid opportunities, Pell Grants commonly serve as the first option for eligible students since they do not require an additional application process or repayment. However, for graduate students or students who are not eligible for Pell Grants, scholarships and other grant opportunities provide an excellent source of funding for higher education. Encouraging student success in math and science, this scholarship enables current high school juniors and seniors to earn their associate degree and high school diploma simultaneously. Applicants must agree to enroll at an any public four-year Utah college after graduation. The Utah Board of Regents offers this scholarship to graduating high school seniors who plan to enroll in an accredited Utah college upon graduation. Applicants must complete a selection of required courses throughout high school, maintain a 3.3 GPA, and submit a composite ACT score of at least 22. This award serves Utah residents who have an incarcerated parent or guardian. Applicants must be high school graduates with a minimum GPA of 2.0 who demonstrate financial need and plan to attend a two- or four-year college in Utah. Dedicated to financial literacy, the Utah Jumpstart program offers this scholarship opportunity in conjunction with the American First Credit Union. Open to graduating high school seniors, the scholarship requires applicants to create a short video about managing and reducing student loan debt.